Valentine's Day isn't even 24 hours in the past, yet we are already looking forward to the next major holiday, President's Day. Hollywood has decided that after six weeks of playing it safe, they are ready to release a ton of new products into the marketplace. The expected result is one of the strongest February weekends ever, with a comic book adaptation almost certain to claim victory despite stiff competition. Ghost Rider is the 800 pound gorilla over the four-day holiday. North American audiences, perhaps seeking to remove all doubt about their shaky movie tastes, are showing strong interest in this Nicolas Cage/Eva Mendes action/drama. For those of you who have never picked up a comic book in your life, this is the tale of a biker/stuntman named Johnny Blaze who makes a deal with the devil (literally) to give up his soul in exchange for a favor. Once that task is completed, Blaze becomes a creature of the night, a flaming skull-headed biker capable of shooting hellfire out of his fingers. Mendes plays the love interest in the movie who presumably is not interested in letting Blaze get to third base with her. 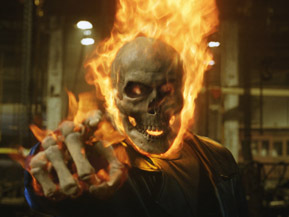 Ghost Rider has been a rumored project that pre-dates even the existence of BOP. In fact, Cage announced his interest in the project the week before our site made its debut. Given that almost six years have passed, it is clear that getting Ghost Rider into production was no easy feat. Real progress was finally made when Daredevil helmer Mark Steven Jackson was brought on board to write and direct. Even then, almost two years passed before the first footage was shot. Clearly, there are difficulties in making a realistic re-creation of such visually unique character. The lack of archetypal villains in the superhero's rogues gallery was also problematic. Eventually, the studio settled upon American Beauty's Wes Bentley to portray the big bad and Ghost Rider finally became a reality.